Gentle Readers, what a long strange week it has been. There is so much going on, it’s easy to forget things. More and more I rely on my digital brain (it takes many forms, including the popular cloud version) to organize my kitchen life. Pictures have become a way of taking notes for me, from where I park in the airport to which kind of lotion to buy. 1. 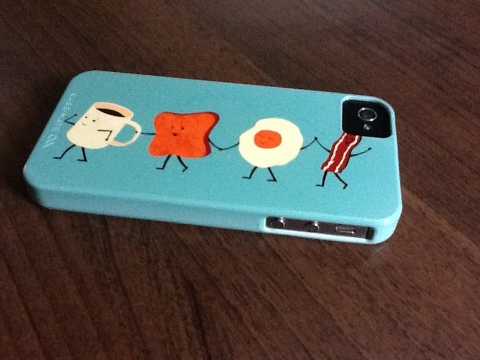 My phone. It’s a camera, and my means of recording the steps in cooking a recipe, the shot in the restaurant, and random grocery store finds. But it’s also my gateway to remembering my grocery list and what I put on the weekly menus. Yes, I have to look myself up sometimes. Incredibly convenient. I love bacon this much. And coffee isn’t half bad either. 2. 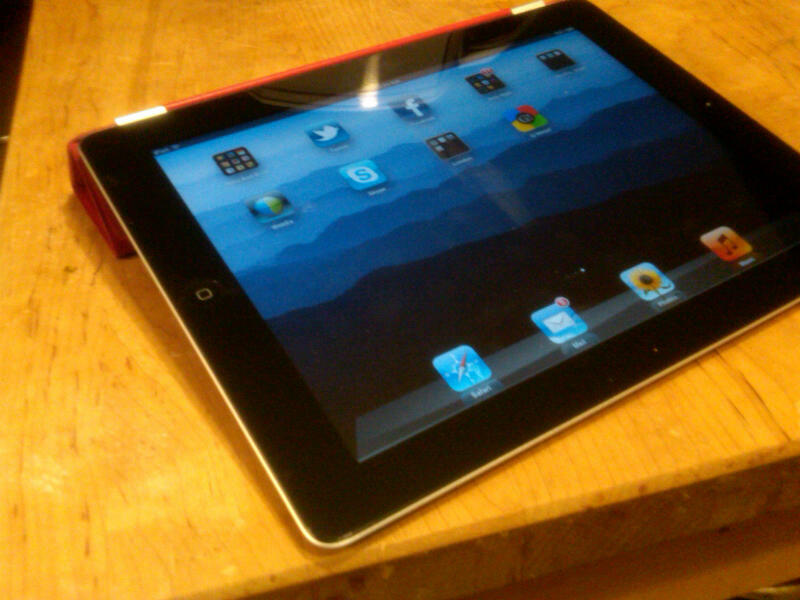 My iPad. A larger form factor, this serves a different purpose in the kitchen. Tablets sit nicely in cookbook holders, and they’re ideal for looking up recipes without squinting. Safely ensconced in a protective cover, I get far less powdered sugar and bacon grease on the tablet than the phone. Bonus! My New Sous Chef: the iPad. 3. YouTube. A video can be worth well over a thousand words. I plan to get back into the business. Just the other night, as I destroyed my beloved jar opener attempting to loosen a particularly tricky salsa lid, I thought back to a vintage piece I did on 3 ways to open a jar. I went through two of them to free the salsa. Thank you digital brain. How do you bring technology into your kitchen? Post a comment, send a tweet. I am here. Promise. Only a little virtualized. Gentle Readers, there is no one as fervent as the newly converted, and The Practical Cook is no exception. You see, though my day job puts me at the bleeding edge of technology, my personal connectivity has lagged behind a bit. Not for any reason in particular, just circumstance and timing. Always something else to be done, until recently. I broke down and bought an iPad. It is in part for The Practical Cooks Junior, who can probably control the space station with it at this point. But it was also a way for me to increase my productivity. I love having it in the kitchen. It’s great for jotting down ideas, checking recipes, taking a picture (in some circumstances), and Tweeting while I saute. And tomorrow, it’s time for Weekly Menus once again. Gentle Readers, is there anything better than a cast iron skillet? Yes, The Practical Cook would argue that one you get as a hand-me-down is better still. 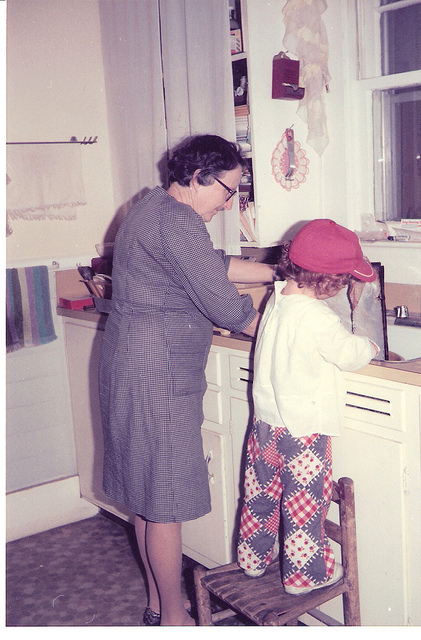 My 10-inch cast iron skillet is from my Granny, featured in the header picture. 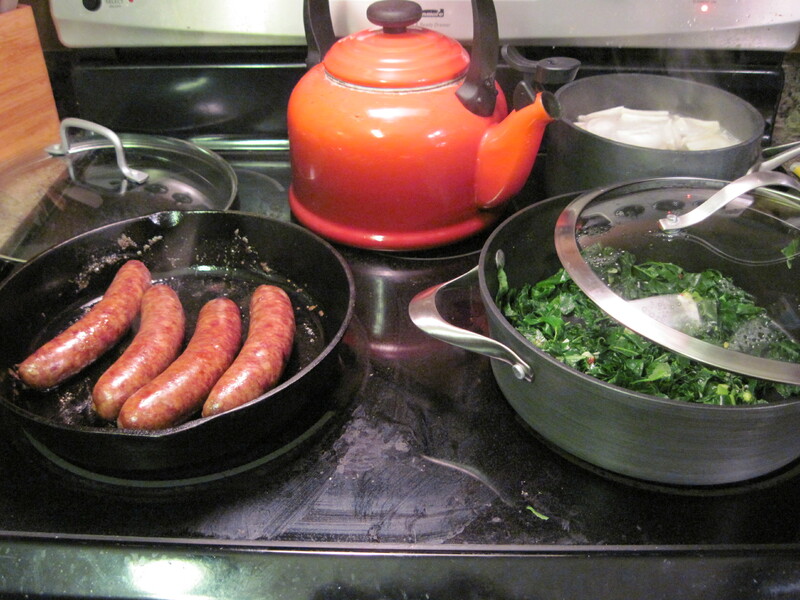 And if you haven’t added a cast-iron skillet to your cooking toolbox, here’s why you should. 1. 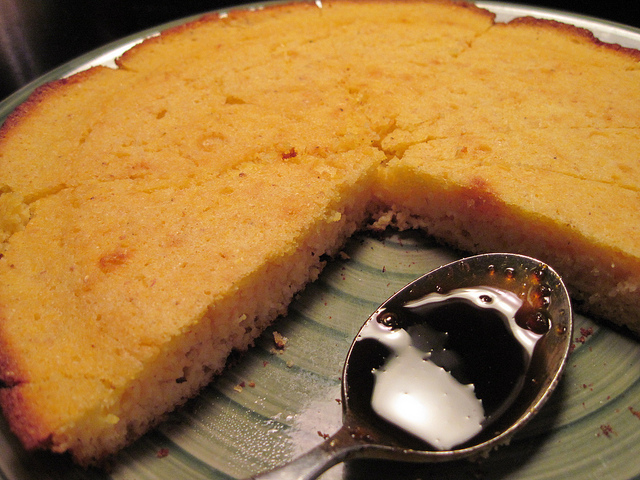 Cornbread. It creates the perfect shape, the perfect crispness, and has a convenient handle for easy oven removal. And do I really have to defend cornbread? Fry some bacon in it first, then make cornbread. You can say thank you later. 2. 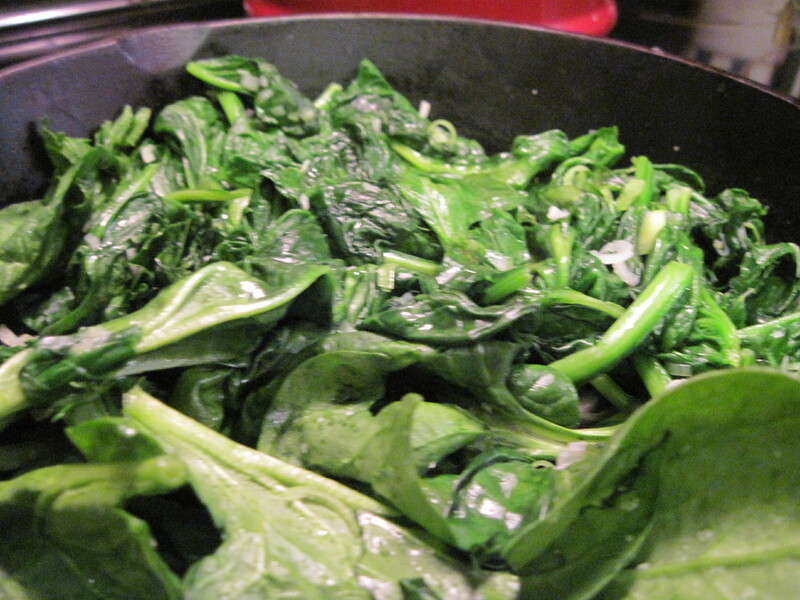 Sauteed greens. Studies have indicated that there is some transfer of iron to food cooked, so I say, why not double down and go all Popeye on the spinach? The high heat tolerance makes it perfect for a quick flash-saute of greens of any stripe, and I use mine for spinach constantly. 3. Preheating. 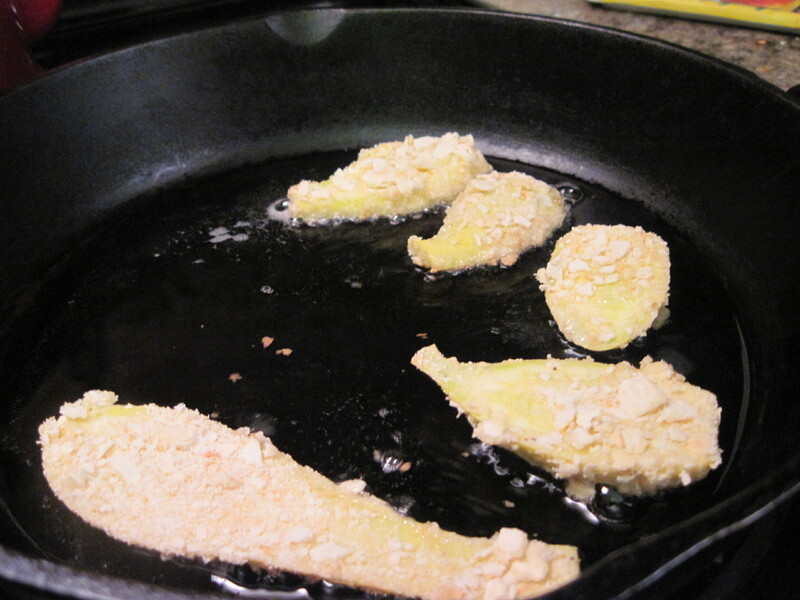 You can get a cast iron skillet hotter and keep it hotter than any nonstick I’ve ever tried. I use nonstick pans, but I am not crazy about any kind of serious heat used on them. So when the French toast recipe of my dreams says preheat the cast iron skillet over medium for 5 minutes, I can do just that. 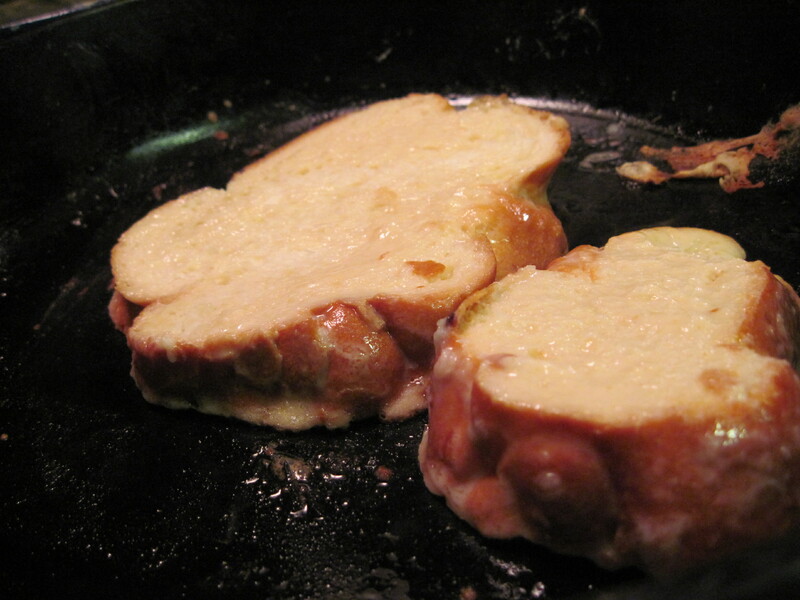 Challah for French Toast Frying in the Pan! 4. Easy cleaning. This is the one reason I think people shy away from cast iron. You don’t clean them in the traditional manner using commercial detergent, but they’re not hard to maintain. I use salt or baking soda to scrape off anything stuck, I wipe down with vegetable oil, I re-season on occasion with a bake in the oven, and I cook bacon whenever I can. That really puts a nice patina on the skillet. 5. Longevity. Yours and the pan’s. I still don’t have my Granny’s strength in either a) wielding the thing or b) touching it with bare hands. Clearly, The Practical Cook’s generation is a soft one in comparison. So we need to toughen up! Oh, and the pan lasts a really long time too. Cast-Iron Skillet Getting Hot Hot Hot! 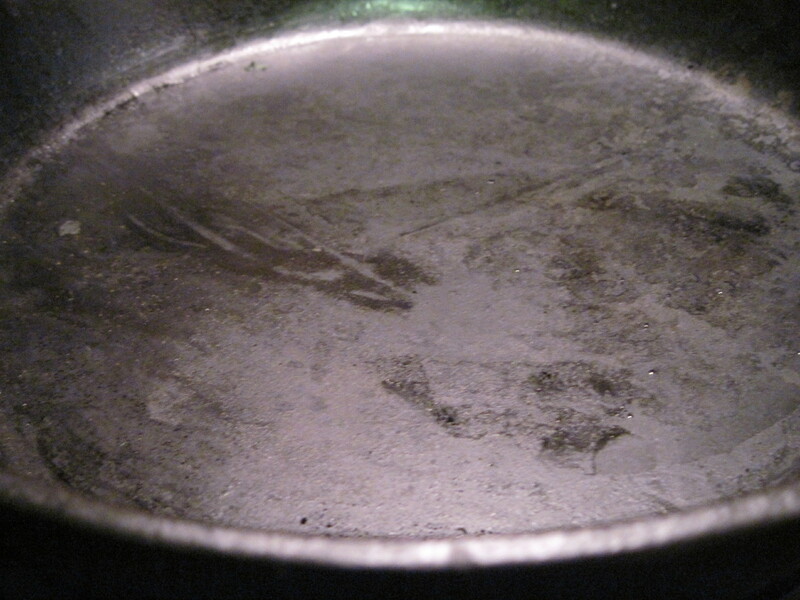 Of course, every time I cook with this pan, my Granny is in the kitchen with me. That’s reason enough for near-daily use. Thank you Granny for starting me down this road. Maybe one day the sausage gravy I make in your pan will equal yours. Are you a cast-iron fan? Share your story in the comments section below! I’m feeling a comments-based giveaway coming on soon. So get some practice now, comment today! Up next, Mango and Blackberry Parfait. Gentle Readers, as you know, The Practical Cook enjoys making Indian food, and other dishes with some kick. One of the key elements is measuring out the ingredients and having them ready to toss into the recipe at a moment’s notice (read, mise en place). But how to accomplish this without growing extra arms? 1. Metal Measuring Spoons. Accept no imitations. If you use turmeric, ever, you’ll understand why I specify. I love that my measuring spoons are still attached by the ring they came on. Easy to find, like my own set of culinary Allen wrenches. 2. Glass Spice Jars with Labels. Years ago, I bought spices in the grocery store, like everyone else. I never used that much cayenne (well, I do now), and it would fade into nothingness. Now, I save the jars of yesteryear, and fill them with the far cheaper and fresher bulk spices from Whole Foods or the local Indian store. Commit to replacing your worthless spices with half as much fresh stuff. You’ll be shocked at the difference. 3. Metal Pinch Bowls. Though in a proper Indian kitchen one would have a multi-welled tray designed for holding various spices, I use this set of 6 small metal bowls I picked up at Macy’s years and years ago (thanks NYC) for well, almost everything. They wash, they’re easy to use, and they are perfect to line up next to the stove to grab and season in the approved order. It’s not just Indian food that makes this items favorites, this picture is from yesterday’s Veggie Chili. 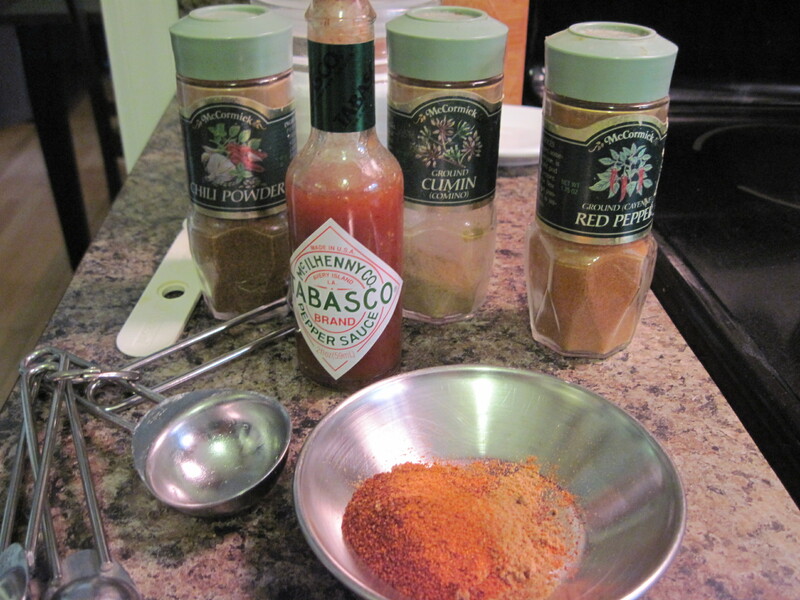 If you season your food ever, the above tips can make your life simpler, and spicier. What’s not to love? How do you manage your seasoning needs? Comment, Tweet, Facebook me. I’m waiting to hear from you. Up next, Cheese Bread Recipe or Improving the Canned Crescent. Gentle Readers, The Practical Cook has been hard at work in the test kitchen, but her mind has wandered to her working life. My days are filled with conversations with engineers. My childhood was filled with one too (we had the best and most well constructed forts, the fastest vehicles, etc. ; thanks big bro). Here are my tools of the trade, as a kitchen engineer. 1. Kitchen Shears. Though I’ve mentioned them before, they’re good for all manner of this things. From cutting butcher’s twine to parchment circles to opening bottles or cutting poultry, they are the utility knife of the kitchen. 2. Pencil. 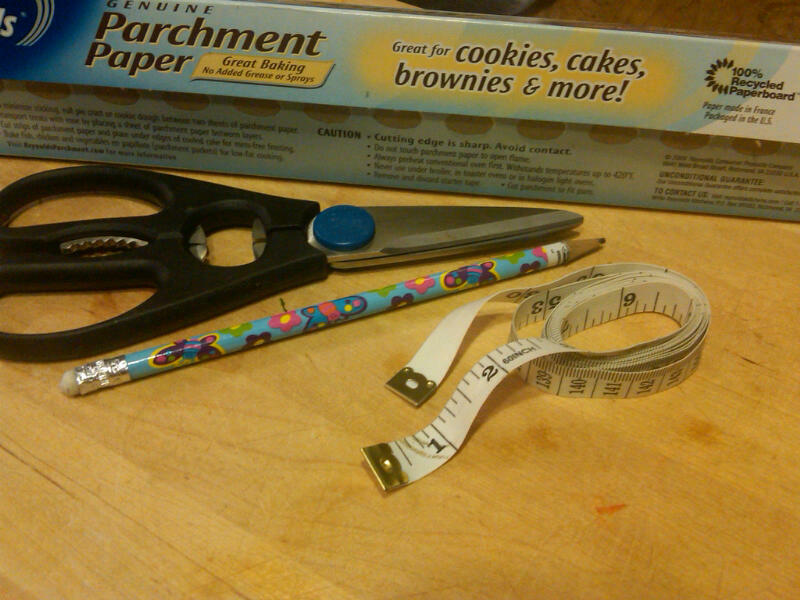 For grocery lists, tracing, labeling freezer items, and more, the pencil is a classic. Mine just tend to be sparkly and covered with princesses or butterflies. 3. Measuring Tape. Sometimes you need to know the exact size of the pan, or you’d like to know if your concept of 1-inch lengths of veg are accurate. What’s in your kitchen toolbox? Comment below. Tweet. Carrier Pigeon. I’m listening. Tomorrow, The Art of the Effortless Party. Covered ice tray glamour shot. 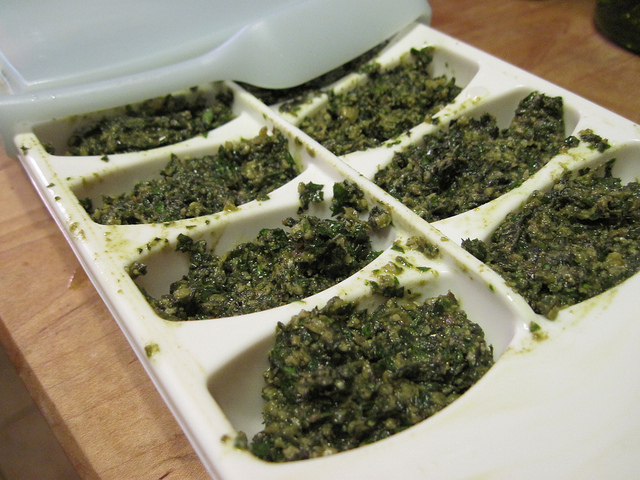 This is my go-to for making pesto cubes, ice, frozen corn in small bites, little stocks, etc. I only have one, I only need one. It is for little things. Because I’m traveling in the next week, I’m pre-blogging. So by the time you read this, you may need some ice cubes (and a break from the rain). 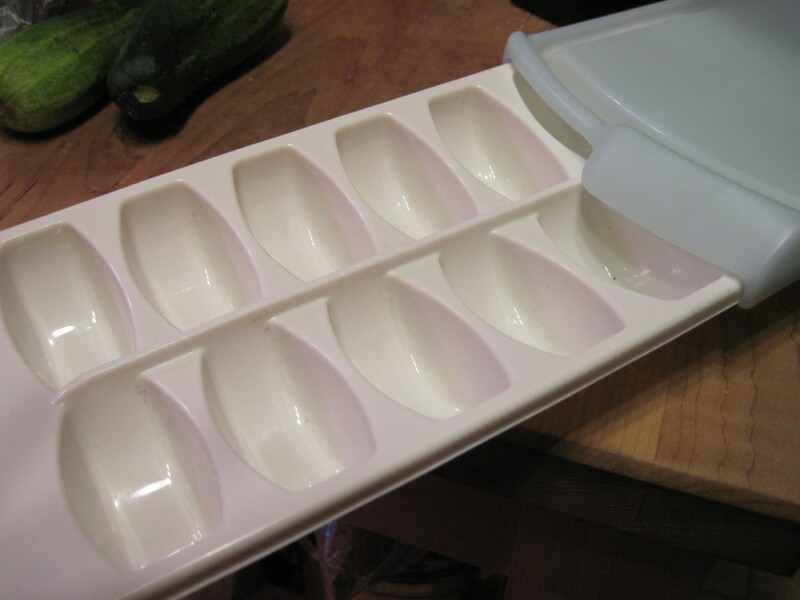 Stay safe, try to avoid Irene, and tell me how you use your ice trays. Post a comment or Tweet! Tomorrow, Weekly Menus, School Time Edition! 1. Cutlery Organizer. This is my very favorite cabinet upgrade. I designed this kitchen myself, and I have a set of formal cutlery, and an inherited one. They both mean a lot to me, and it’s hard to find a way to store and use it. Bring on the bi-level organizer drawer. It’s built for this, doesn’t take up extra space, and I love it. 2. Countertops. Due to recent kitchen re-org, the countertops are now visible and usable. Huzzah! Nothing is more wonderful than open countertop space in the kitchen. You can make more waffles that way, run 2 projects at once, or have a place to put things down. 3. Dishwasher. With kids, it runs constantly. Better still, they can load and unload it. 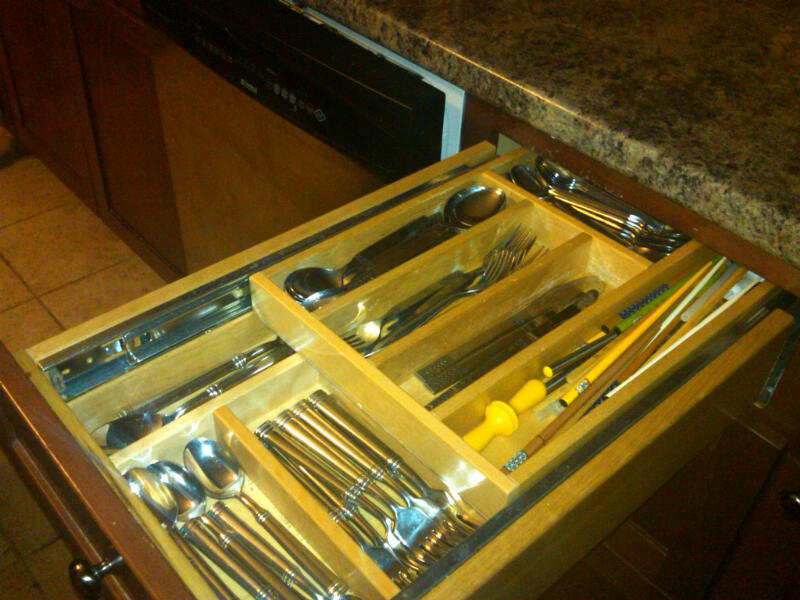 And with a clean countertop at hand, and the cutlery drawer right there, it’s fast and easy to get the job done. Score one for placement. What do you love, or hate, about your kitchen arrangement? These are the things I love, more on the latter in another post. Post your thoughts below in a comment, or Tweet! Tomorrow, as always, we have Weekly Menus!